Scale and convert image files. Is there a better alternative to TransformPicture? Is TransformPicture really the best app in Image Editing category? 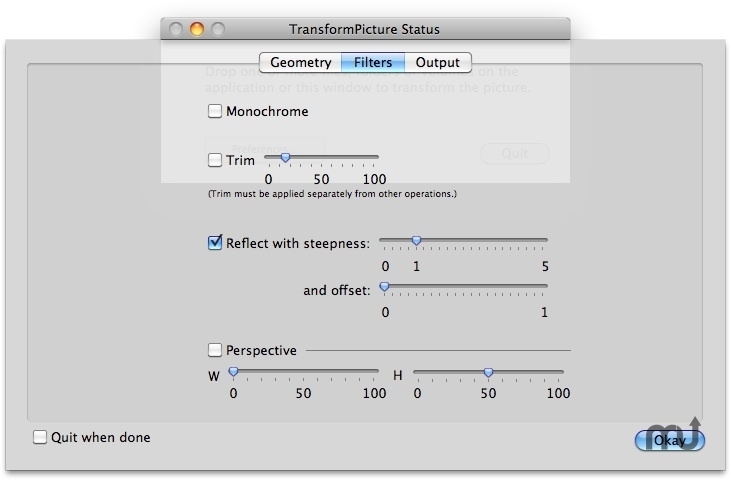 Will TransformPicture work good on macOS 10.13.4? TransformPicture is a utility for batch scaling, trimming, reflecting, perspective distorting, flipping, and rotating pictures by a given percentage and degrees, and then converting to other graphic formats: PNG, BMP, TIFF, JPEG, JPEG200, GIF, and PICT. Drop multiple files or folders onto the application in the Finder, or onto the main window to process pictures in batch. Use the preferences window to configure various options. TransformPicture needs a rating. Be the first to rate this app and get the discussion started!